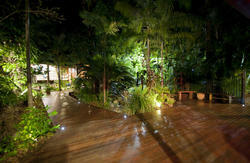 Port O'Call Eco Lodge is resort style accommodation offering a range of rooms for the budget concious traveller. 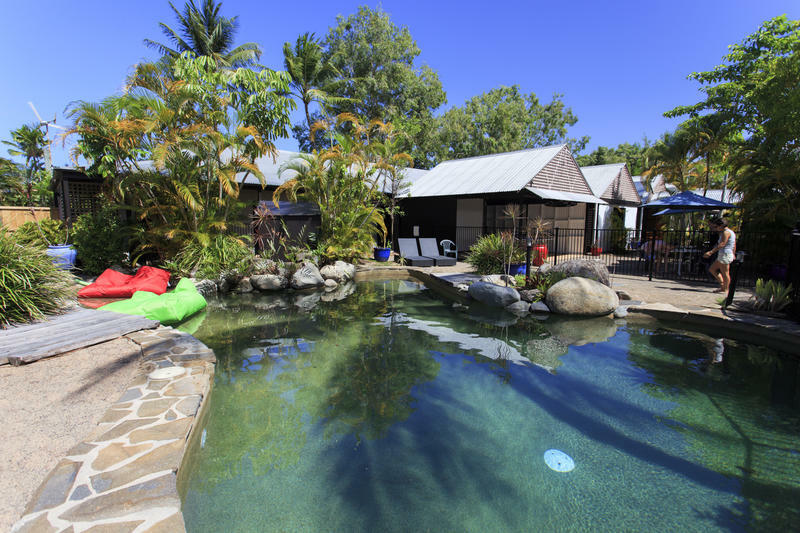 Located 5 minutes walk to beautiful Four Mile Beach and the Marina, and 10-15 minutes walk to Port Douglas Village. The Lodge is environmentally friendly green star rated and is ecologically sustainable with solar heating, water and lighting efficiency. Facilities include a lagoon style pool, Bar & Bistro, kiosk, tour desk, free WiFi, guest laundry and communal kitchen with free tea and coffee. Free transfers from Cairns every day except for Saturdays (for stays of 2 nights or more, conditions apply). Port O'Call offers Deluxe and Budget double/twin rooms and four share rooms all with private bathroom, tropical outdoor area, air-conditioners and ceiling fans, bar fridge and hairdryers. Budget double/twin rooms are also available with shared bathroom. Enjoy our relaxed, friendly atmosphere providing comfort, security and fun. Port O'Call Lodge has a free courtesy bus which can pick you up from your accommodation in Cairns city or from the airport every day except Saturday. The bus runs once a day only, picking up from Cairns city at approx 10:30am and from the airport at approx 10.45am. Conditions apply - guests must stay for a minimum 2 nights. Bookings are essential with details of pick-up point in Cairns city or if picking up from the airport - flight number and arrival time. Please note we can only meet flights arriving no later than 10.00am. Return transfers to Cairns accommodation houses/airport leave Port O'Call Lodge at approx. 8:45am. It is essential to book if you need this service on arrival. Sun Palm Australia Coach have a frequent shuttle service between Cairns and Port Douglas which can be booked through us for AU$40.00 one-way. Simply provide us with your accommodation pick-up point or flight details and credit card information. Major car rental companies have desks at the airport and offices in the city. By car the journey takes approx 1 hr 30 mins along the world-famous Captain Cook Highway with its breathtaking views.